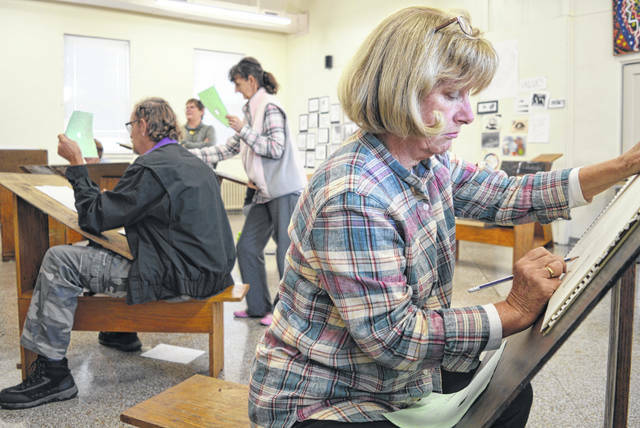 This basic drawing seminar is part of WILL (Wilmington Institute of Lifelong Learning), a Wilmington College outreach to the broader community that began in 2010. Participants this week were doing a still life in pencil. Visible from right foreground to the left background are Bobbi Hagen from Wilmington, Ed Stromberg from New Vienna, his wife Serena Stromberg of New Vienna, and instructor Linda Stanforth.